The Orange Squirrel wood carving cameo appearance in Eat InkRecipes, Stories, Tattoos book. Several years ago a Bloomfield, NJ watering hole experienced major renovations and emerged as The Orange Squirrel restaurant. My wife and I witnessed the transformation while out and about with our standard poodle Fleur on our daily walks. After learning the restaurant was to be named The Orange Squirrel I carved a squirrel grasping a mug. I presented the carving to the Executive Chef Francesco Palmieri on opening night. While enjoying drinks and outrageously delicious food at “The Squirrel” my wife and I hunt for our squirrel perched among the menagerie of squirrels in various locations about the establishment. It’s exciting to hear about the various ways Chef Palmieri finds his way into the spotlight: “He’s on the TODAY show!”, “He’s on FOOD Network!…” It was to my surprise to learn our little carved squirrel found its way into Chef Palmieri’s spotlight. 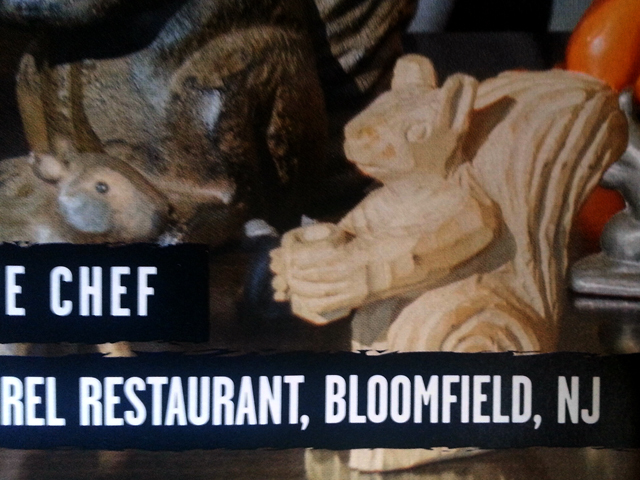 Our squirrel is in a photograph along the chef in Birk O’Halloran & Daniel Luke Holton’s new book Eat Ink! Way to go little guy. Nice work.